Over the 2 1/2 years I’ve owned my LEAF a few minor issues have occurred with a speaker failure and window winder both of which waited until the next scheduled maintenance for repair under warranty. 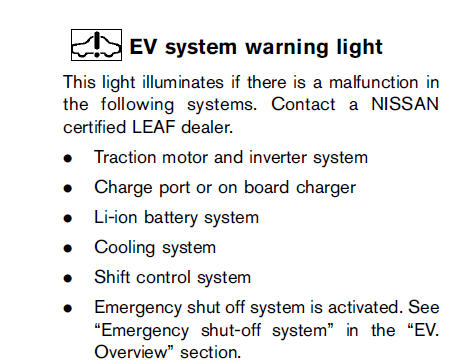 This last week I had to take the LEAF to a dealer on an urgent basis due to an EV System Warning Light that came on on the dashboard. When I bought the LEAF I fully expected to be in the shop every 2-3 months having something with the electric system worked on. It’s new technology, once expects failures. Much to my surprise the vehicle has been very reliable never failing once and only requiring half as many trips to a shop for scheduled maintenance thanks to not having any engine oil to change or injectors to clean. The warning light came on after two failed attempts to charge the vehicle at a public charging station at Peartree Village shopping precinct in Brentwood, TN. I did get a good charge at an adjacent unit. Once I started the car up and drove off I noticed the warning light and later looked it up in the user manual. The manual advises the owner to ‘Contact a Nissan Dealer’ to deal with the issue. I have a program on my smart phone called “LEAF Spy Pro” which allows one to retrieve a whole host of data from the cars computer systems. I hooked this up and read the Diagnostic Trouble Codes (DTC’s) and noticed two entries. The code itself isn’t very explanatory but did seem to be something to do with charging the vehicle. Clearly the two failed charging attempts had triggered these errors. I dropped the car off that evening at the dealer and picked up a loaner rental vehicle. The next day the dealer called and asked a series of questions about the previous days charging. Had I used that unit before, did it employ a charge timer? What timers did I have programmed on my car and at home? 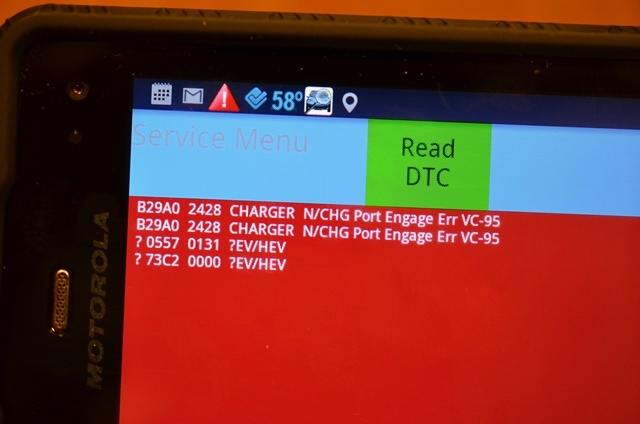 After checking with corporate Nissan they came to the conclusion the car was just fine, all blame for the diagnostic codes was with the public charging station. I picked up the car that night and its been fine ever since. I reported the findings to Blink / CarCharging group to let them know their charging station was setting diagnostic codes in LEAF’s. Newton Nissan Service Department Rock! The dealer, Newton Nissan, didn’t charge for the visit and even washed my car for free too. Great customer service!! The rental loaner vehicle was complementary as well thanks to my having purchased an extended warranty when I bought the vehicle new. When I dropped off the car it had a 20% charge. When I picked up the car it was charged to 80%!! Free fuel as well!! When was the last time you took your gas car into the dealer and got over 1/2 tank of fuel for free? This entry was posted in Blink, Carcharging, Customer Service, Electric Car, Level 2 EV Charger, Newton Nissan, Nissan LEAF and tagged LEAF. Bookmark the permalink.